The locations were chosen because they embody a particular trait of successful policing, such as effective use of data, strong community relationships or a commitment to officer safety, Lynch said Monday in an interview with The Associated Press. The first visit is planned for Thursday and Friday to Miami-Dade County in Florida, where Lynch is scheduled to recognize the Doral police department for its community policing strategies. She’ll also host a youth town hall and a community policing discussion in Miami, among other events. The other locations are Portland, Oregon; Indianapolis; Fayetteville, North Carolina; Phoenix and Los Angeles. “It really is our hope to highlight the areas where police and community members are sitting down together and figuring out, ‘How do we all make this work? '” she said. The visits represent the second phase of a community policing tour that Lynch, a former federal prosecutor in New York, began last year after being sworn in as the nation’s top law enforcement official. In that first phase, she visited cities where police forces are working to overcome troubled relationships with their communities. Now, the focus turns to departments that are seen as successful in implementing “pillars” of policing identified in a White House report last May. Each city on the tour represents a different pillar, which include building community trust, community policing, crime reduction and officer training and education, Lynch said. “I’m going to jurisdictions where departments have taken those pillars, have made substantial and concrete advances toward them and where we’re seeing positive results,” Lynch said, adding that she hopes they can be guideposts for departments looking to improve. The initiative is part of a national discussion on police use of force and effective law enforcement tactics, a topic that’s taken on new urgency amid a series of high-profile police shootings of unarmed young men in places including Ferguson, Missouri; Cleveland; and North Charleston, South Carolina. 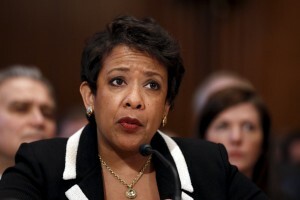 That conversation has often been challenging and “painful on many fronts,” Lynch said. But, she said, she’s been encouraged by the number of police departments looking to evolve on training and tactics and to improve cooperation with the Justice Department, which has the authority to investigate troubled departments and press for sweeping overhauls. In Ferguson, city officials are preparing to vote Tuesday on whether to adopt a proposed settlement with the Justice Department that calls for widespread changes in police policies, training and practices. New estimates from the city say the cost of implementing the agreement could approach $4 million in the first year alone. The Justice Department would have the option of suing Ferguson if the City Council rejects the deal, although the attorney general said she hopes it won’t come to that.